Above: Today... Henry Govan, Larry Holder, Paul Gentry, John Gill, and Phillip Waldrup. Four out of five have beards. Coincidence, or just good sense? 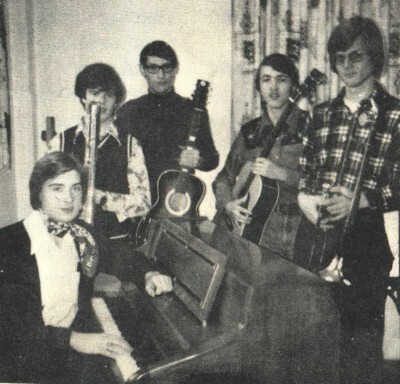 Right: Back then... Henry (at piano), Paul, Phillip, Larry, and John. Below: John, Henry, Phillip, Paul, and Larry. Well, after 25-plus years, all 5 of us finally got back together. 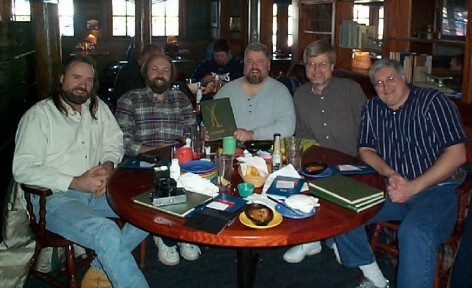 We monopolized a table at Red Lobster in Jackson, TN from 11 a.m. 'til a bit past 4 p.m. on January 4, 2003, catching up on old and new stories, as well as probably setting a new record for the longest lunch! John's in the computer field in Memphis. Henry has a coffeehouse near Nashville (See link below). Phillip is a physician in Memphis. Paul teaches chemistry at Cordova High. 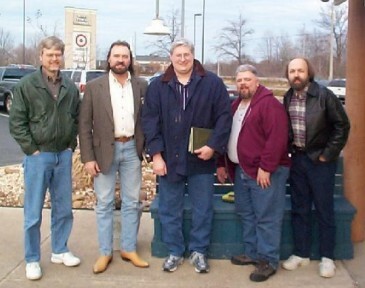 Larry's in the computer field at UT Martin, and writes songs on the side (see link below).